Detroit’s Creekside Neighborhood is one of the most fascinating in the city and because of that, I ride through the neighborhood a couple of times a month. 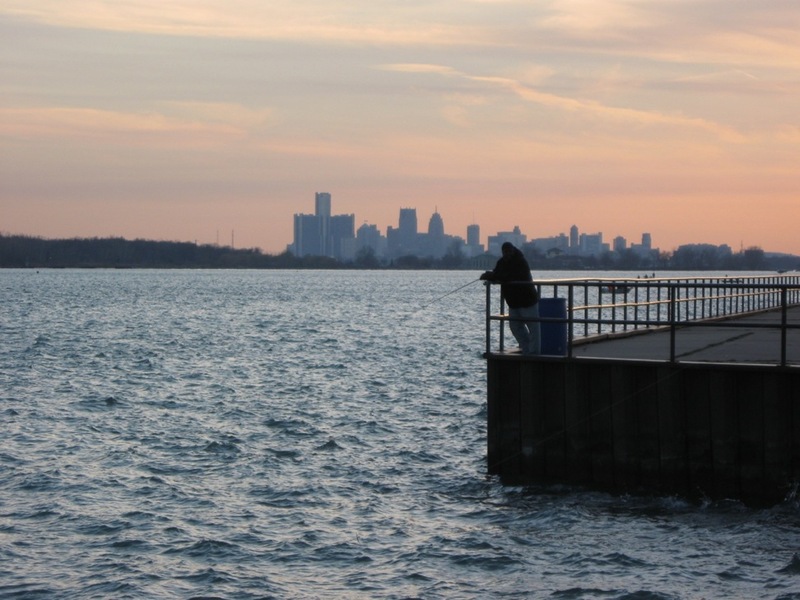 It’s a large, diverse neighborhood with well-maintained riverfront parks that offer some of the most spectacular views of the Detroit River. This far eastside neighborhood has a large concentration of Arts and Crafts style homes, English Tudors, simple wood frame houses and small cottages. To me, the most intriguing feature of the neighborhood is the many canals that wind through the southern part of the area. 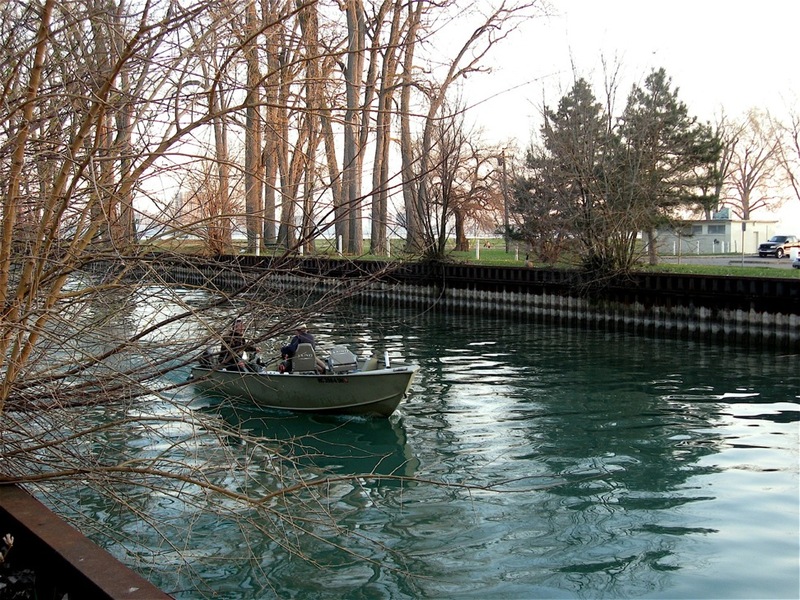 These canals were used as hiding places by rumrunners during Prohibition as they smuggled liquor across the Detroit River into the U.S. from Canada. 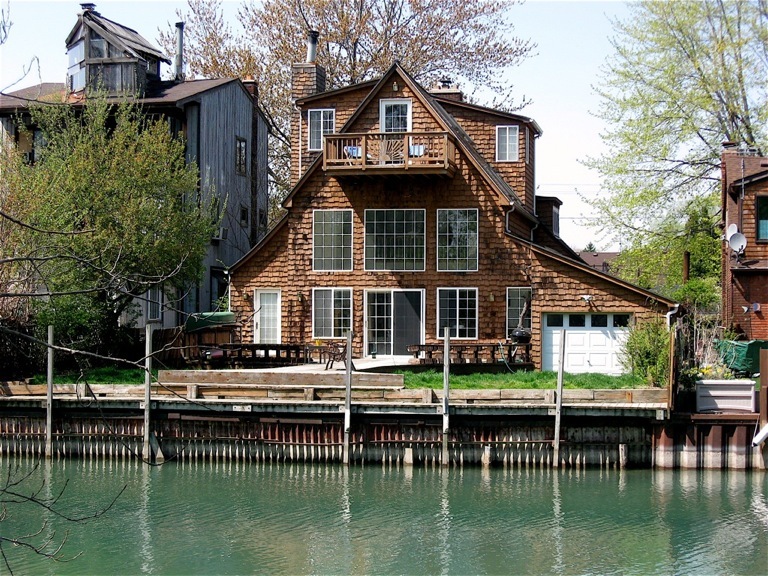 Because I’ve always been fascinated with this out-of-the-way section of Detroit, its history, the people living there, the housing stock and the canals; I plan on writing an occasional entry on the Creekside community. Since the canals are mainly what this neighborhood is known for, I’ll start with them. From what I understand, there are about three miles of canals in the neighborhood, with Fox Creek being the main feeder. Fox Creek runs from East Jefferson Avenue south along Alter road to the Detroit River. Along the way, various tributaries feed off the Fox creating a series of canals and islands. This is quite unusual for a major urban center. 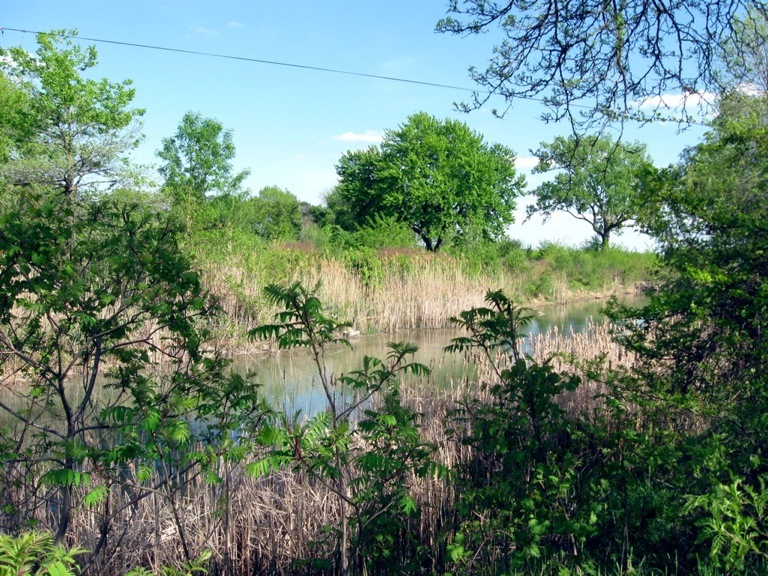 I also understand there were many other man-made canals, offering prime hiding spots for the rumrunners, but over time they have been filled in by erosion. Lining the canals are lots of boathouses and docks. While many are in use, others are dilapidated and have deteriorated beyond use. They remind me of an old, weathered fishing village found in a remote area of the east coast. Riding the streets along the canals, I usually see fisherman that have accessed their favorite spot through abandoned lots. Others are sitting on one of the many bridges linking the islands, with their line in the water, hoping to land the big one. I’ve yet to see any of them reel in a fish. There are some great parks in this neighborhood that line the Detroit River. Mariners’, at the foot of Alter Road, is the smallest of the bunch. Even so, every time I’ve ridden there, the park is loaded with fisherman taking advantage of the close river access. 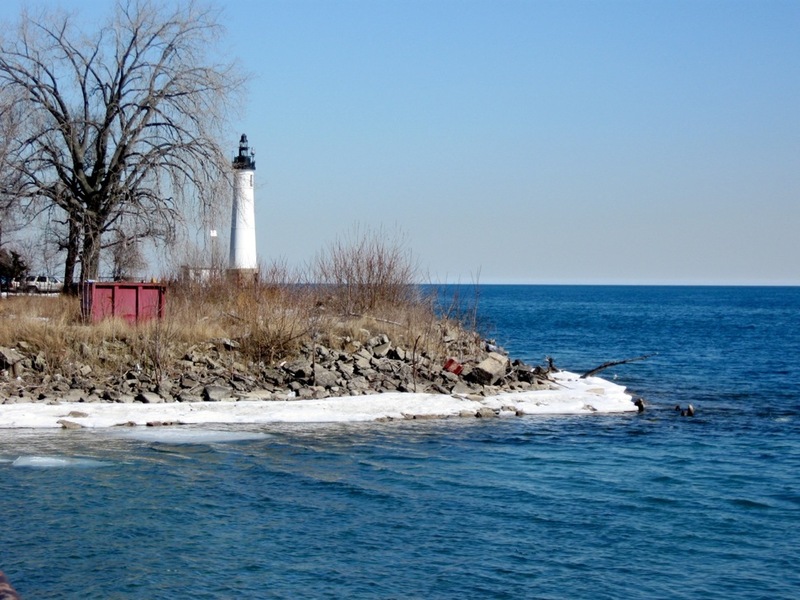 It’s also home to the Windmill Point Lighthouse. Immediately to the west, across a small canal, is Lakewood East Park, my favorite. Lakewood is an island park, surrounded by canals on three of the four sides with the Detroit River on the other. This park isn’t maintained and has reverted to a natural, wooded state. SUV’s and other vehicles have created winding paths through the brush that are perfect for bike riding or walking a dog. While riding there, I’ve heard the “scratching” call of Ringneck Pheasants, sounding much like an out-of-tune violin. I’ve seen Red-winged Blackbirds sitting on cattail plants while they sang in their distinct, soothing, matter-of fact tone. 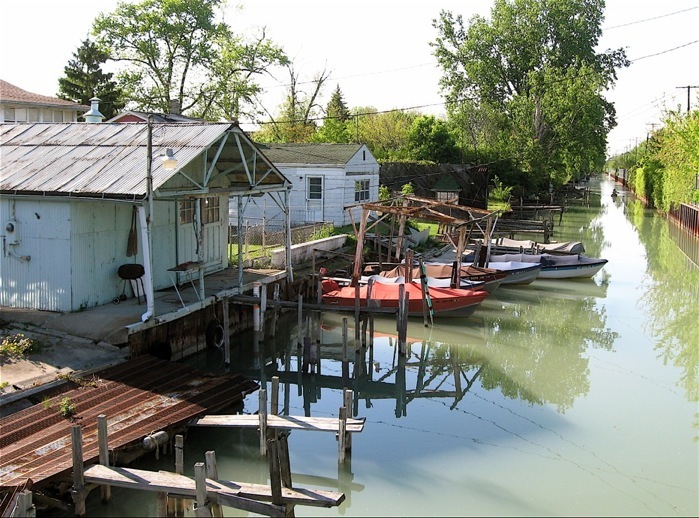 It’s a relaxing, serene environment where fishermen in boats slowly pass through the canals on their way to the Detroit River. Reminiscent of a place in the country, Lakewood East is the perfect escape from the tattered urban environment I ride through to get there. A little further west, toward downtown Detroit, are two of the biggest riverside parks within the neighborhood – Brush-Ford and Maheras-Gentry. Both are large, open, well-maintained parks. Families come there to picnic, run their dogs, fish, take in the breathtaking view of the passing freighters or to simply ponder life while looking at the Detroit skyline in the distance. Despite their size, it isn’t uncommon to see a lone fishermen watching for a tug on the end of his fishing pole. “I love this park,” said a young mother walking her dog while juggling a baby carrier. “Living here is like having my own private riverfront lawn,” she said, referring to the beauty of Brush-Ford Park. I agree. There are times I’ve ridden through these parks and pretty much had them all to myself. In some ways, that’s the beauty of them. 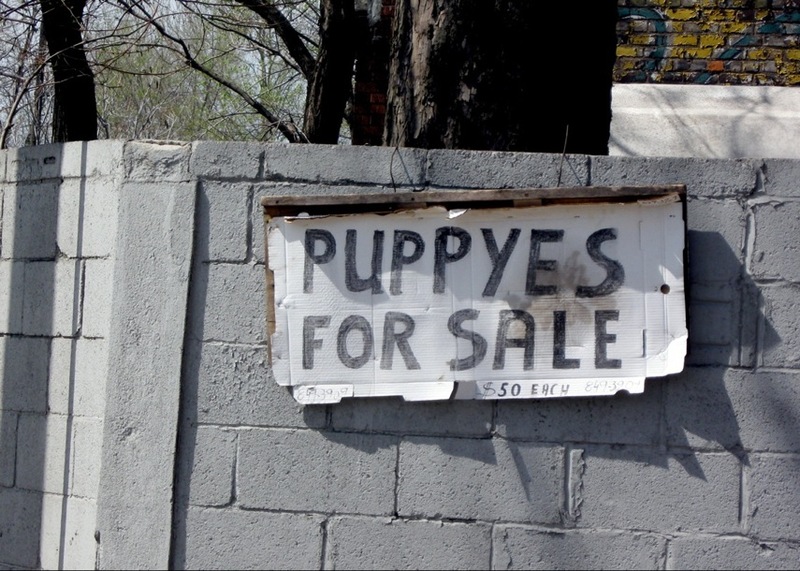 As I pedal through many of Detroit’s neighborhoods, it’s not unusual to come across some pretty quirky signs. 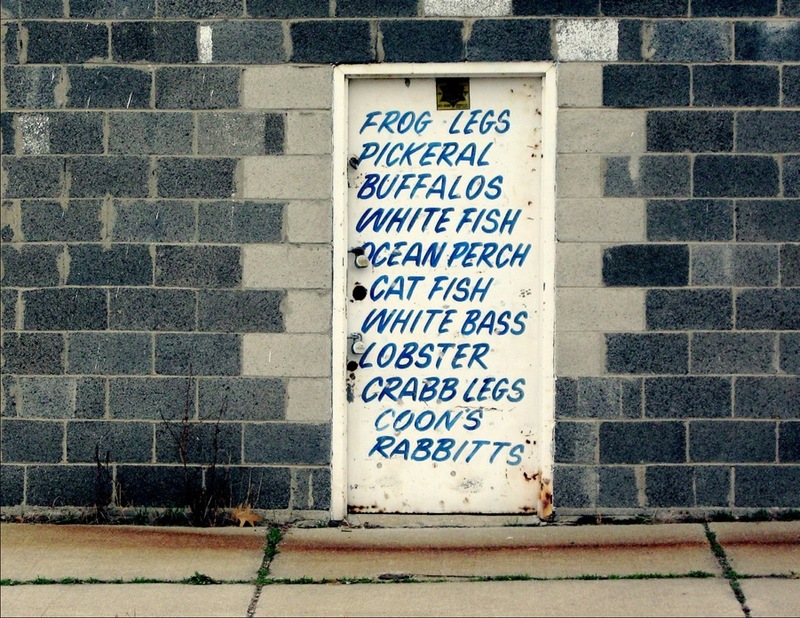 Some are hand painted signs I can barely read because of dripping letters; others are signs, with clean letters painted on the sides of buildings full of misspellings. 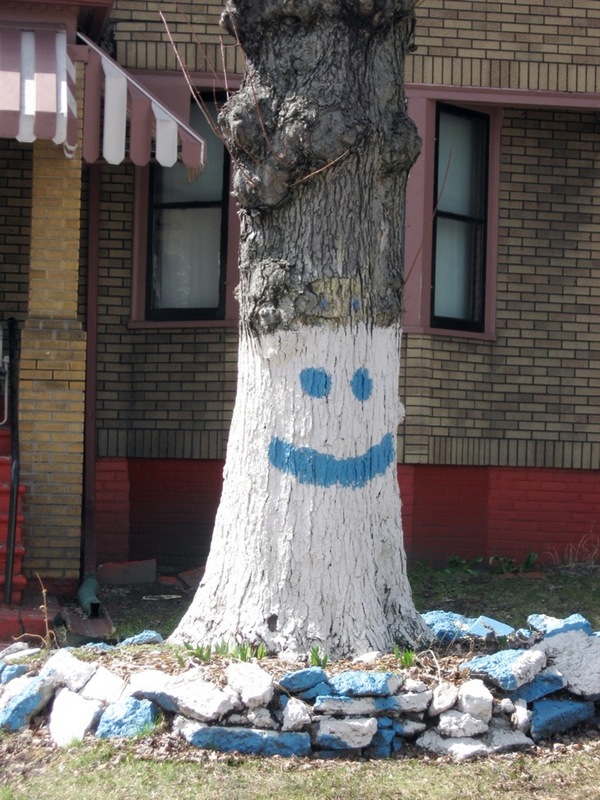 Others are nailed to trees, and some are just sitting in front of homes or businesses advertising some special deal. 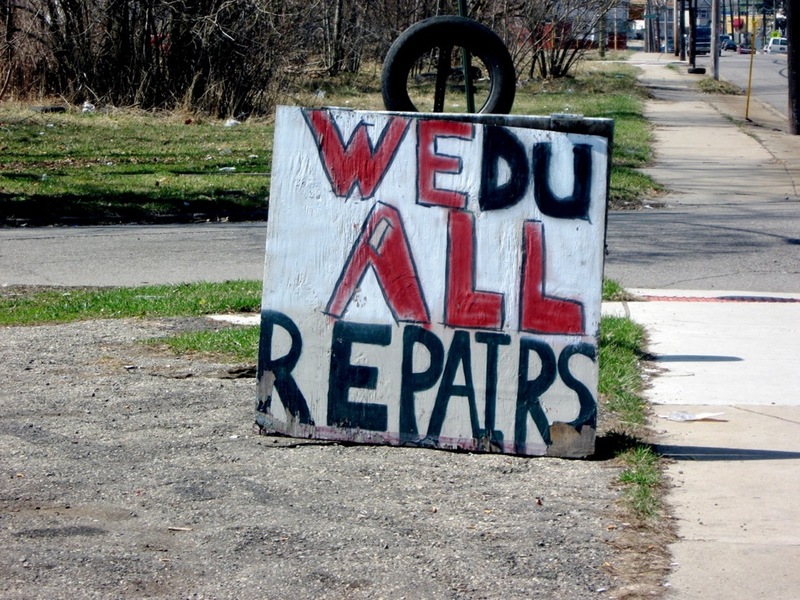 Some might be a “keep out” warning of some type or advertise a vehicle repair service. Many I see are quite humorous. On occasion, I’ll be sharing photos of these amusing signs. I think they’ll make you chuckle. I counted four misspelled words on this list. 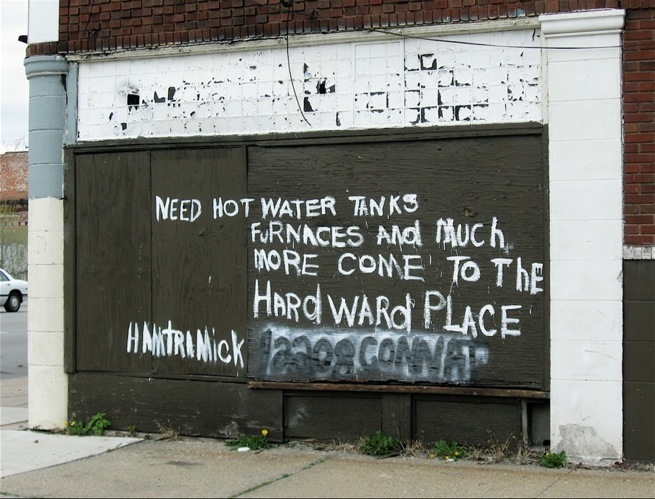 I think they mean “Hardware” place in “Hamtramck”. But, I don’t want to! I like this “Lowcation”. Okay… I’ll keep this place in mind. An American classic, “One Flew Over the Cuckoo’s Nest” was published in 1962 to great acclaim. Set in an Oregon mental hospital, the story is told through the eyes of “Chief” Bromden, an inmate suffering from schizophrenia. Bromden, a long time patient whose job in the asylum is to sweep floors, pretends to be a deaf-mute. This ruse allowed him almost unlimited access to offices, meeting rooms, etc. where he overhears many of the staff’s dirty little secrets on running the hospital, particularly those of head nurse Ratchet. The oppressive Ratchet runs the show by keeping inmates in a “fog” through verbal intimidation, the use of various drugs, and other means, like shock treatment. Enter Randle McMurphy, a spirited, defiant, small time convict sent to the hospital from a prison work farm where he was serving time for battery. Full of life, he easily gains the inmates’ trust and takes advantage by hustling them for money and cigarettes. After a short period, he realizes that he’s more than a diversion to the inmates and actually gives them life and independence, including the Chief who has now began to speak to him. McMurphy soon becomes a major thorn in nurse Ratchet’s side. Nothing slows his constant harassment of her, not even the shock therapy sessions she insisted he needed and put him through. One evening McMurphy bribed the night attendant to “look the other way” while he threw a party on the ward. Unfortunately, this party led up to a series of stunning events that included Ratchet being nearly choked to death by McMurphy, his eventual demise and the final gift he received from his friend Chief Bromden. This is an exceptionally rewarding and beautifully written book that offers keen insight into the inner workings of an asylum, the authorities running it and the means they use to manipulate and control the individuals in their care. I particularly like Kesey’s detailed, brilliant, descriptions of the many mental patients and the afflictions they were dealing with. I found the book inspiring, quite funny at times and yet sad in many ways. It’s also a great study on the pressure society puts on us to conform, rather than expressing our own individuality, and the struggle between the two. Kesey based this book on what he observed and stories he was told by inmates while working as an orderly at a mental hospital. During that time, he was also in a group of volunteers given LSD by the U.S. Government, through a secret program, to see how the drug could be used to manipulate one’s mental state and alter brain functions. Much like he observed while working in that mental hospital, the LSD gave him a first hand perspective on what it must be like living as those patients were. I glance over my shoulder and I see this older fellow, with longish gray hair waving his arms back and forth as if to say, “No, time out.” I could tell right away that this guy was a real character. “Taking a picture of this sign,” I said to him while pointing at it. “Ah, I put it there as a joke,” he said walking toward me. 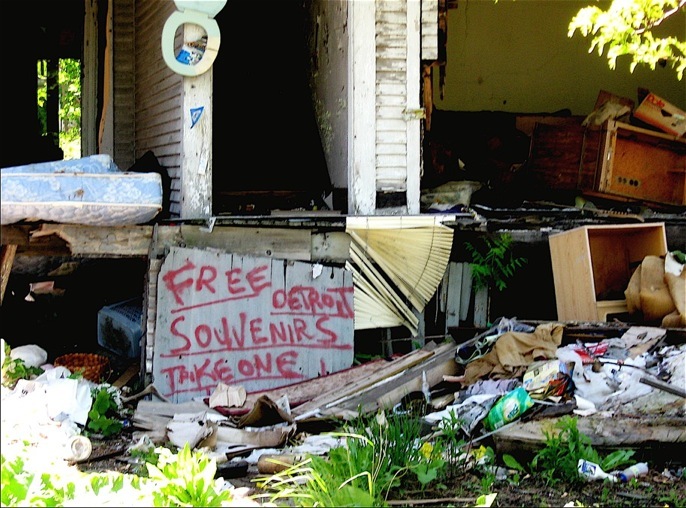 “I like to take stuff out of abandoned homes and put it here, it’s something a little different.” he told me. “Very cool.” I said knowing he wasn’t listening. “Where the hell did everybody go?” he asked while standing in the middle of the street with his arms open. 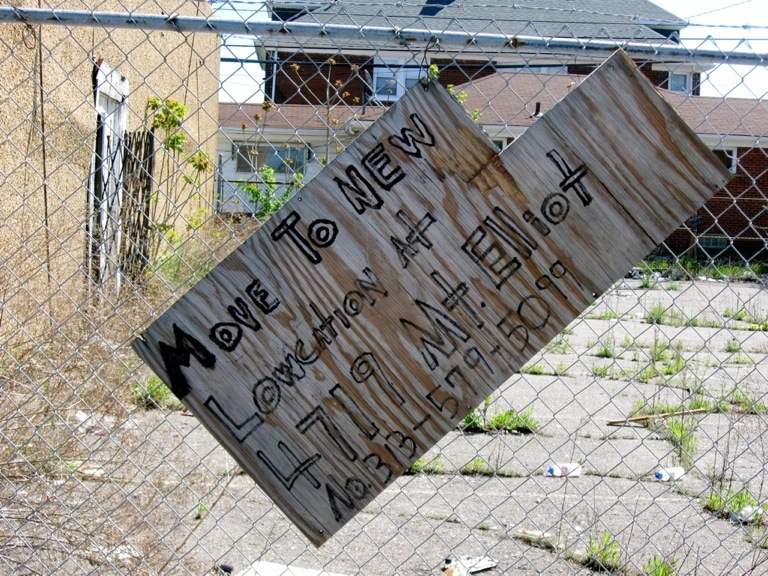 “Look around here, you’ll see street after street with little or no houses left.” he said. “Where the hell is everybody?” he asked raising his voice. I shrugged my shoulders as I held my hands out, palms up. “How many miles do you ride a day?” he asked loudly. “I don’t know, around 50- 60 per week,” I said. “50 – 60!” he said surprisingly. “Are you retired”? He asked. “No, laid off.” I said. “From where?” he asked in a demanding voice. “A advertising agency.” I told him. “What?” I asked a little concerned. “There are five white guys on this street, all at once!” he said shockingly loud. “I don’t believe it,” he said again while smiling. I couldn’t help but laugh at this weird scene. So I ride off in that direction to check it out. As I approached his two-story house, I took a good look, and I cracked up. Right above his front door hung a sign that read “White Trash”. John’s Carpet House is not a place to shop or a place to buy carpet. In fact, it’s not even a house. 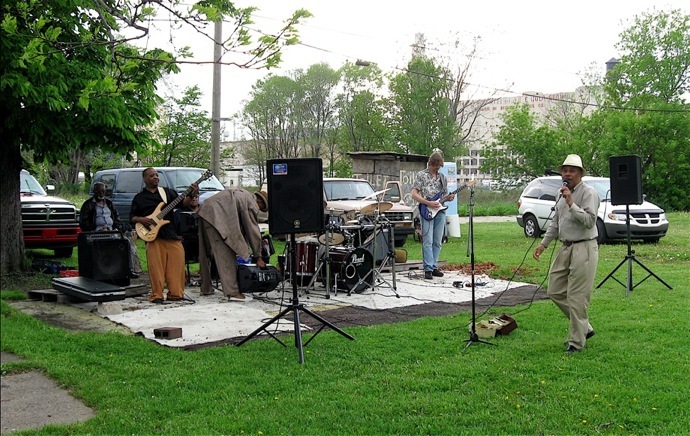 It’s a gathering place for many of Detroit’s finest blues musicians who come together on Sunday afternoons to jam and play the blues… good electric blues, with a lot of soul, played in a mowed section of an open field on Detroit’s near eastside. At the corner of St. Aubin and Frederick streets lays the carpet. 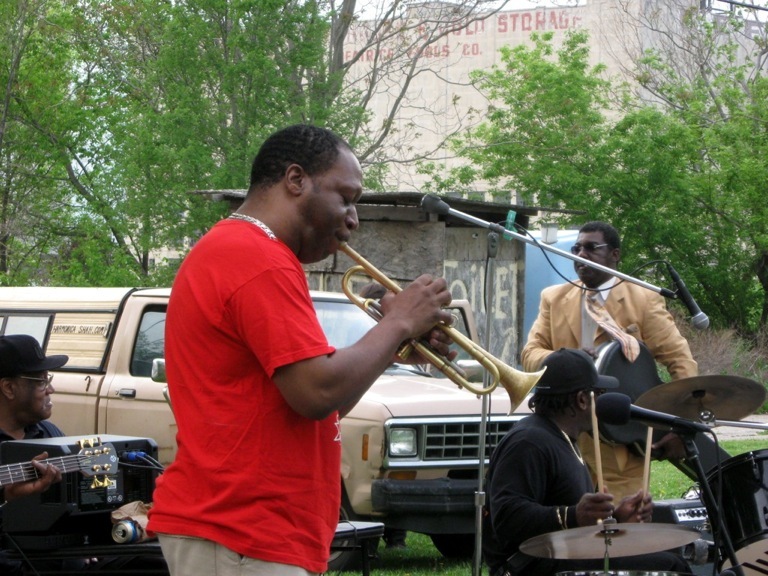 It’s spread out under a Chestnut tree and on Sundays it’s filled with a number of Detroit music legends doing what they do best; playing the blues. Big Time Pete, who’s been organizing this event since John’s passing a few years ago, kicked off this year’s jam session by inviting “Harmonica” Shah, guitarist/singer/harp player Kenny Miller, drummer Stixs and others to last Sunday’s session. And they came to play! Despite last Sunday’s cool, damp weather, bikers, chess players, assorted neighborhood characters, groups of people barbecuing, and bicyclists like myself, found their way to this isolated section of the city where pheasants roam, to hear some exciting down home blues. “They’re playing some hot music man, but not as hot as it’ll get come summer,” said a guy standing next to me. “You gotta come back man,” he added. The Sunday jam sessions are free (donations welcome). They start at 3 p.m. or so and continue until the sun sets in the west. Musicians are invited to stop by and, from what I understand, some real blues gems are known to sit in for a song or two. They’ll be playing the blues in that field through the fall. 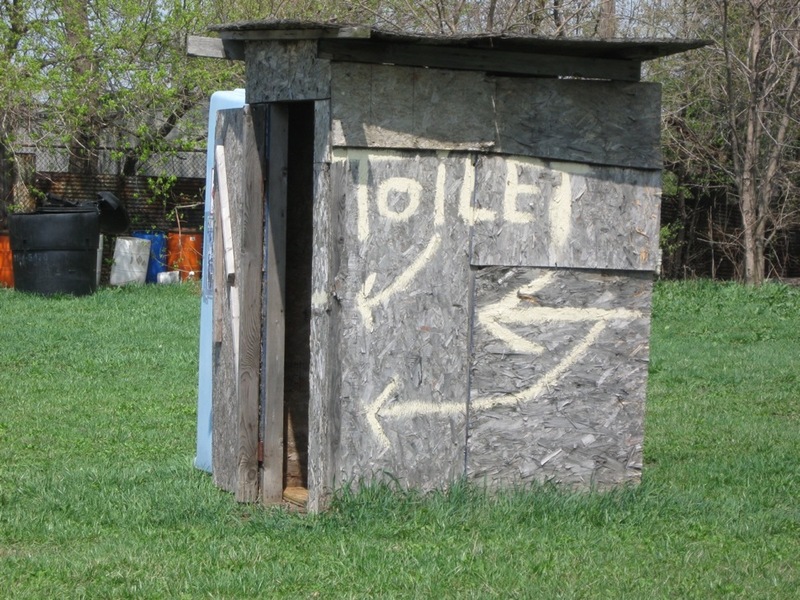 Look for an outhouse on Frederick Street near St. Aubin. 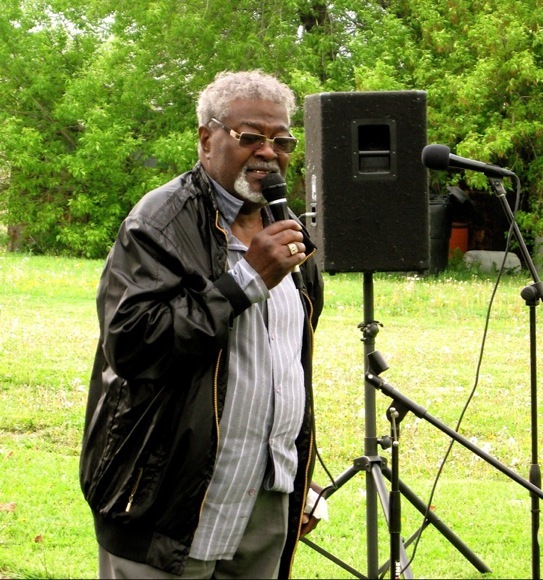 Once you find it, you’ll discover some great Detroit blues musicians. Conrad’s masterpiece and most famous work, was written in 1899 as a three-part series for a magazine. It was published as a novella in 1904. The story’s is based on a boat trip Conrad took through the Congo during his time as a sailor. The main theme of the book is colonialism and its effect on the natives. The main character, Charles Marlow, gains employment with a trading company dealing in ivory that operates deep in the jungles of the Congo. The story follows Marlow as he trudged overland to an outpost where a steamer he’s to command is waiting. Along the way he encounters Africans working in chain gangs, dying of diseases and starvation. Arriving at the outpost, he finds his steamer has been mysteriously wrecked. While waiting for it to be repaired he hears of Mr. Kurtz, a highly regarded and successful ivory trader living in an isolated outpost. Marlow learns from those living at the outpost that Kurtz, who works for the same company, can be viewed as a rival. They hope Kurtz will die in the wilderness because of his ruthless, oppressive control over the natives. Once the steamer is repaired, Marlow heads up river with ivory hunters to find Kurtz. The river winds it way through dense jungles where natives can be spotted through the thick growth, watching as they pass by. The ship is eventually attacked by spear throwing natives, and many on board are killed. Later, Marlow and crew come across a Russian adventurer that knows Kurtz. He tells them Kurtz has become a chieftain, worshipped by the natives, that participates in diabolical rites. Marlow finally gets to Kurtz, who is dying in his outpost surrounded by rows of human heads mounted on poles, and carries him to the steamer for the trip back to civilization. He dies along the way and is buried in a muddy hole along the river. Upon his return to Europe, Marlow visit’s Kurtz’s fiancée and lies about his death in order not to destroy her idealistic view of him. The book can be read as a pure adventure story or as a study on European imperialism of the late 1800’s. Some find the story racist and barbaric, but I don’t agree. I view it as a reflection of the times, as I understand it, where it was common practice for European explorers to seek out treasures in far away lands, no matter the consequences. To me, “The Heart of Darkness” is about exploitation and greed, and the horrors they breed.